Serious Shoulder Injuries. 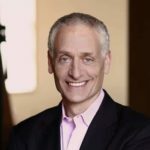 When Should I See A Doctor? Shoulder injuries can be serious. You fell on your shoulder and heard a pop. Or you now notice a bump on your shoulder. Is this a serious shoulder injury? Some of you fell or landed on your arm and now you can’t move it. How do you know if your shoulder injury is serious and if you need to see a Sports Medicine professional? Spontaneous shoulder pain is very common after 40. Often times we can ignore it and see if it will get better on its own. That may be a good strategy for most of you, but it might be a bad idea for others. How can we tell who needs to have their shoulder seen by an expert sooner rather than later? When should you see a doctor after a serious shoulder injury? Our shoulder motion is controlled by a number of very important muscles. The rotator cuff are a series of 4 muscles which collectively allow the shoulder to move. Injuries to the rotator cuff can cause weakness. Between the two bones of the shoulder we have a labrum, or a cartilage disc which helps maintain the stability of the shoulder. Injuries to the labrum can cause issues with instability or dislocation of the shoulder. What are the signs to look for to know whether or not you have a serious shoulder injury? 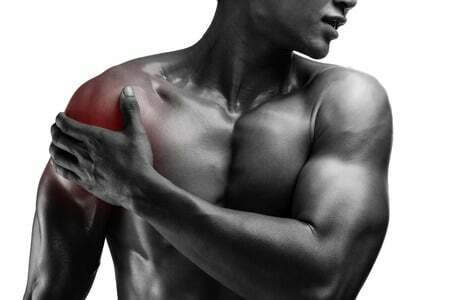 Weakness of the shoulder after an injury can imply a significant injury to the rotator cuff. After a fall on your side or with your arm outstretched you can put enough force on the shoulder to rupture or tear the rotator cuff. Small tears of the rotator cuff typically do not produce weakness. Large tears of the rotator cuff, however, do cause weakness. A fall on the shoulder which leads to significant weakness when trying to use your arm should lead you to see a doctor. More information on rotator cuff injuries here. Shoulder instability, or a shoulder dislocation can occur after a shoulder injury. If you fell with your arm outstretched, or if you fell hard on the side of your arm there is a chance that your shoulder dislocated. Some shoulder dislocations spontaneously go back into place or reduce. Not all shoulder dislocations have to go to the emergency room to be put back into place. Many of you will feel as if the shoulder slid out of place when you hit the ground. Some of you will feel the shoulder slide back into place when you try to get up from the ground. If you feel as if the shoulder came out or slid back into place you should see a doctor. 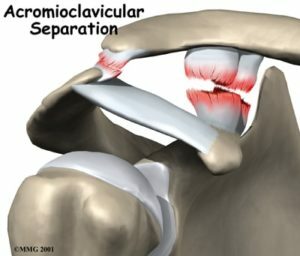 More info on shoulder instability here. If you fell onto your shoulder and heard a pop and are now experiencing severe pain or weakness you could have torn your rotator cuff or labrum, or you could have an AC Joint separation. A pop in the shoulder, accompanied by severe pain, a bump on the top or weakness when trying to lift the arm should be a signal that you should see a doctor. After a fall, or a heavy check into the boards while playing hockey you may notice a bump on the top of your shoulder. This is always accompanied by severe pain on the top of the shoulder. This could indicated an injury to the AC Joint, or a shoulder separation. Most of these AC separations do not require surgery, but they should be evaluated by a doctor to determine which type of AC separation you have. Knowing which type of AC separation you have will determine if it is a serious shoulder injury, or if it will recover over time on its own. Pain over the Collarbone or Clavicle. A fall onto your shoulder can transmit the force of the fall to your collarbone. This can result in a fracture of the collarbone or clavicle. You may or may not notice a bump over your clavicle, but you will have severe pain in that region. While many clavicle fractures will heal well without surgery, it is important to know what type of clavicle fracture you have and whether or not surgery presents itself as a reasonable option to consider. 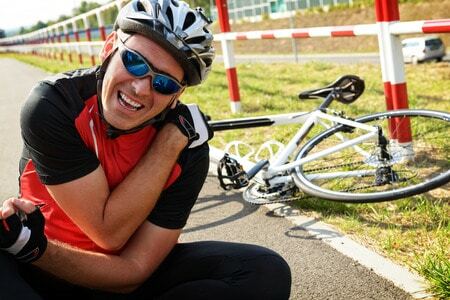 Many shoulder injuries can be serious. The earlier they are evaluated by a sports medicine professional the better the chance you have at a successful return to sports. Hopefully these 5 signs of things to look for to know if you have a serious shoulder injury are beneficial. ← Recovery From An MCL Injury? Hello, I have a type 3 shoulder separation. I have gotten xrays done already, however, my appointment with an orthopedist is not until after 3 weeks of the injury. Will my shoulder not heal correctly if this is a serious injury requiring surgery? (So far, I just have my arm in a sling). Any info helps thanks! Your surgeon will not be able to reduce your AC separation. The bump will stay there.So the 3 week wait shouldn’t affect you. We typically do not operate on many Type III AC separations anymore. Only those that remain ‘unstable’. It’s hard to say… I would need to examine you to confirm your suspicions. I have shoulder pain and when I move my arm away from my body laterally horizontally I hear a pop along with pain . Then on top of the shoulder posterior right on the joint if you press on it there is pain kinda on the ligament ? It’s been like this for months and I’m wondering if I should see someone for this problem ? What do you think the problem is, I know it’s hard to diagnose this problem via email however just take a guess. Most common cause of pain at our age is rotator cuff tendinosis We can also have small degenerative tears and bursitis too. Other causes include arthritis and calcific tendonitis… less common cause of pain though.